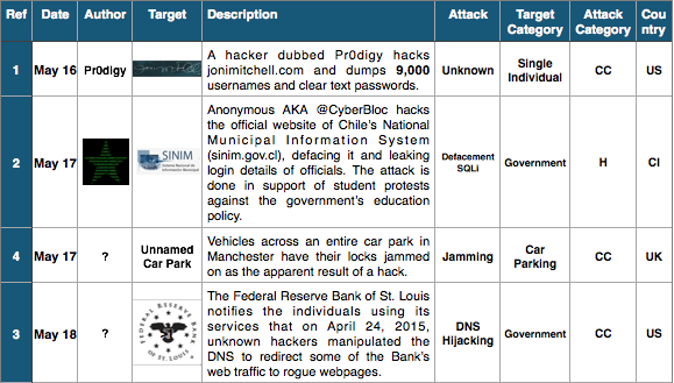 It’s finally time to publish the timeline of the main cyber attacks occurred in the second half of May. A two-weeks period that will be remembered for an unprecedented trail of massive breaches, started with Pacnet (number of victims unknown), and continued throughout the month with CareFirst BlueCross BlueShield (1.1 million victims), Adultfriendfinder (4 million), the Saudi Ministry of Foreign Affairs (1 million), the Internal Revenue Systems (100,000), the music streaming portal Gaana.com (7.5 million) and, last but not least, the Japan’s universal public pension system (1.25 million), with a resulting damage report exceeding 10 million of compromised individuals. These attacks have obviously overshadowed all the other “minor” events, with the partial exception of the DNS Hijacking attack against the Federal Reserve Bank of St. Louis (discovered on May 18, but happened on April 24). As usual, keep the level of attention high, and if you want to have an idea of how fragile our electronic identity is inside the cyberspace, have a look at the timelines of the main Cyber Attacks in 2011, 2012, 2013, 2014 and now 2015 (regularly updated). You may also want to have a look at the Cyber Attack Statistics, and follow @paulsparrows on Twitter for the latest updates.